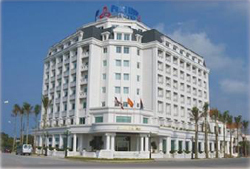 The Best Western Pearl River is Haiphong’s only First Class Hotel providing luxury and elegance in most refined service. The Best Western Pearl River has undoubtedly the best hotel location: never more than 5 min to the city centre, to the airport, to Highway 5, and to the new Exhibition Centre. Plus: absolutely fresh and clean air. Hi, I am the “Pearl River Hotel“, and I would like to welcome you warmly at our beautiful new Best Western Pearl River Hotel. Our 9 storey state-of-the-art hotel building features 101 elegantly-appointed Rooms & Suites; Jade Restaurant offering fine Asian and Western specialties; Meeting, Conference and Banquet Facilities for up to 600 guests; and Feelings, the most spacious Wellness & Fitness Spa in the area. Our guest rooms and suites are designed to exceed the needs of the modern global traveler. . The classic approach: Exciting cocktails and tasty finger food at one of our comfortable hotel bars. Revitalize yourself in our 1500 m2 Wellness & Fitness Spa Feelings. Divide the waters, slurp a refreshing drink on our comfortable sun beds, and participate in our weekend Evening-BBQs at Dolphins Pool & Bar.